Its never too early or too late to start taiko! Sing, Dance, Move, and Taiko! a great bonding experience for the family! We get to play on all these beautiful taiko drums! Taiko Together classes are currently available at Los Angeles Taiko Institute since 2015. The program first started in Taiko Center of the Pacific in Honolulu, Hawaii. It has been gaining popularity with over 100 families participated in the program since 2013. The students love the songs , dance and games. It is a very unique and musical bonding experience for the family. 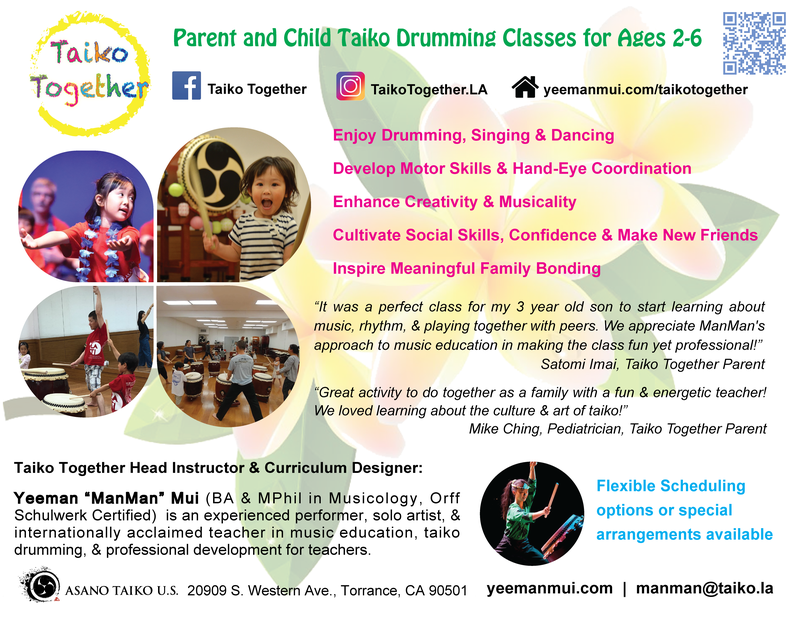 The Taiko Together curriculum helps define parents and children’s natural sense of musicality through song, dance, body music and taiko drumming, which the goal is to create an engaging environment for students in hopes that their musical experience will reverberate beyond the classroom. Interested in having Taiko Together at your School?